Maluril is a Dunmer scholar studying the Dwemer culture. He lives in his room in Mzinchaleft, along with many bandits who serve as his bodyguards. One of the bandits has the key to his room in his inventory. He is not just some innocent researcher, as illustrated in his journal. 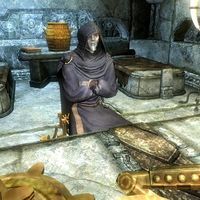 He seems to have made some enemies in his past as he becomes the target of a Dark Brotherhood contract, which may explain the events described in his journal. Maluril spends most of his time wandering around inside his room, surrounded by many Dwemer artifacts. He wakes up at 8am and immediately begins to wander around. He can usually be found having a quick meal or drink while seated on a chair. After wandering around in his room the entire day, Maluril heads to his bed at midnight where he will sleep for the next eight hours. He wears blue mage robes and a pair of boots. In combat, he uses a staff of firebolts and he also carries a spare steel sword which he may use. Once you've picked up your contract, you may ask Nazir about him. He will say, "He's dangerous. Very dangerous. A rogue Dark Elf mage doing research into Dwarven artifacts should be both respected... and feared. Just not by you." Like with most targets of the Dark Brotherhood, you may also have a word with Maluril before killing him, as he is not immediately hostile to you like his companions. He will be shocked to see you: "By the gods! What are you doing here?" and you can reply in three ways. If you walk away instead of answering him, approaching him again will have him scold you, "The power of Mzinchaleft is mine! Begone from here!" "The only thing you will discover in Mzinchaleft is death." "Death? Oh, there's death to be found here, to be sure. But not my own!" "Fascinating race, the Dwemer. Powerful... and extinct." "Yes... quite. But if that power could be harnessed. Controlled. The possibilities would be... But... who exactly are you? And why are you in here? I think it best you leave Mzinchaleft. These ruins can be quite... dangerous." "Who are you? Why are you here? Leave this place. I have much work to conduct...."
His full name is Maluril Ferano, his last name, however, is only ever mentioned inside in a note. Despite Nazir's comments, Maluril does not know any spells. An angry note written by Maluril to his guards can be found in the game files but goes unused in the final game. Maluril belonging to the Dark Brotherhood faction can cause you to get expelled from the Dark Brotherhood if he gets attacked at the wrong time. This page was last modified on 29 December 2017, at 21:00.